JULY 2017: REFER-A-FRIEND & BE REWARDED! Note: This is for existing GrabCar Partners who would like to refer their friends. Please click here if you have not been referred and would like to learn about our special incentive for you if you join us. 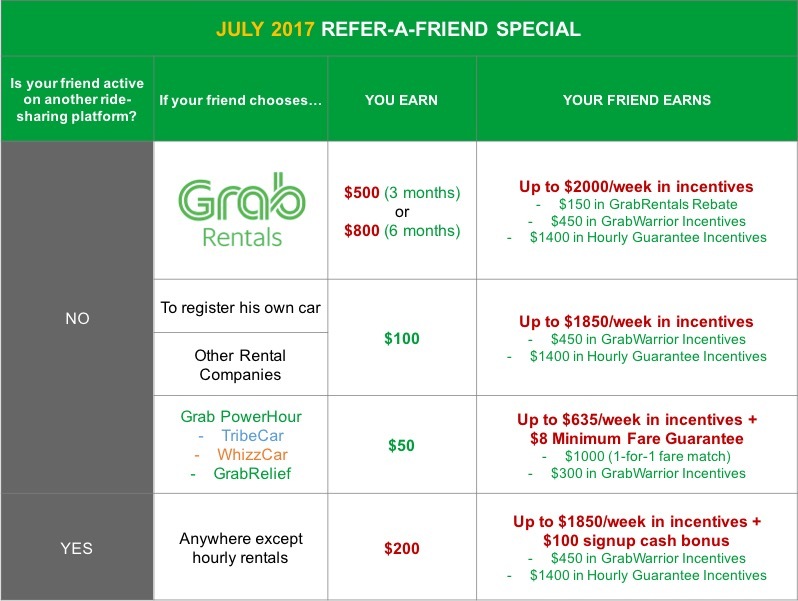 Our JULY Refer-A-Friend special helps you boost your earnings as a GrabCar Partner simply by referring your friends to us! Each friend you refer could earn you up to $800 in cash when they complete at least 10 trips during their first 7 days of account activation. This means you get more cash payout, earlier! Simply bring your friend to our new Grab Driver Centre and let us sign them up for you, it’s really that easy! [BONUS] When your friends rent a car from GrabRentals, they are instantly eligible for up to $150 a week in loyalty incentives and cash rebate that lasts till 30 Sep 2017. Click here to learn more. HURRY! The sooner they sign up, the longer they’ll enjoy the rebates. Whether your friend uses their own car, rents from GrabRentals, or is active on another ride-hailing platform, this is the best time to drive with Grab. Refer your friends and get rewarded with up to $800 in cash, today! Gives you the flexibility to choose how much you want to drive and earn. You can earn up to $450/week in incentives with Grab. You could earn a total potential of $2,000 in incentives… and this is ON TOP of your own earnings. Earn as high as $30/hr during special offer periods with this incentive! Eligible trips are unique passenger trips on GrabCar Economy 4 & 6-seater, JustGrab, GrabShare & GrabFamily. 20% commission applies. Please note no commission is applied to surcharges (e.g. waiting time, additional stops made after booking, ERP). 3) GrabShare Rides Matching Rebate! Drive with assurance on GrabShare as Grab will refund our commissions if your ride is unmatched! This incentive applies to unmatched GrabShare trips. To qualify, maintain CR of below 10%. No AR requirements for this incentive. Commission refund is paid in Credit together with incentives. Check weekly incentive EDM to see your best offer. 4) Guaranteed up to 2X usual earnings in HIGH DEMAND AREAS, now including Bukit Timah! You can now enjoy guaranteed fare boosts of up to 2X in High Demand areas including Bukit Timah! If your fare is not at least 1.5X the usual fare, Grab will top up the difference. No AR/CR requirements for this incentive. 20% commission applies on all fare top-ups. For your convenience, incentive after commission will be paid in 80% Cash, 20% Credit. Q: How do these rewards work? Receive up to $50 welcome credits when they activate their Grab account. Earn up to $2000 weekly with Grab. This amount is on TOP of their earning with Grab. Grab delivers incentive schemes directly to the driver’s app and can be viewed and tracked from within the application. Q: My friend is interested to drive, but he doesn’t want to commit to a long term car rental. What can I do? Share your ride and add your friend as your named Relief driver (only eligible for GrabRentals main hirers or Registered Own Car owners. The best part is: You will still get $50 when they complete 10 trips within 7 days of account activation. Rent with GrabRentals to enjoy up the following deals: Rebates up to $150/week. Details here. Tribecar hirers get to enjoy a welcome credit of $18 courtesy of Tribecar. For drivers who choose to rent with hourly fleet partners, extra credits provided by hourly fleet is tied to a 1TPH (Trip Per Hour) criteria. Only applies to GrabRentals & Own Car. NEW DRIVER must be named as relief driver and complete 10 trips within 7 days of account activation. Payment made by Week 4. Proof of activity must be presented upon signup to be eligible for this incentive. Please provide past statements when signing up. Trips definition: GrabCar Economy 4 & 6-seater, JustGrab, GrabShare and GrabFamily unique passenger trips only. REFERRER: Paid in CASH if NEW DRIVER completes 10 trips within 7 days of account activation. Payment made by Week 4. Welcome Credit: Paid upon account activation; (i) $50 Welcome Credit. For any signup cash bonus, NEW DRIVER needs to complete 10 trips within 7 days of account activation. REFERRER MUST be present with details submitted upfront during NEW DRIVER registration. NO amendments after application form submission will be entertained. In registering for this incentive, the participant acknowledges that he has read and understood the terms of his existing rental agreement with any other vehicle provider and confirm that by participating in the scheme, they are not in breach of any obligation under the rental said agreement; the vehicle they will be using for the scheme is not subject to any restriction that prohibits the vehicles from being used for purposes of the scheme; and he has not informed Grab nor is Grab aware of any reason that would disqualify the driver from participating in the scheme.